So yesterday Chris and I went to Hobby Lobby in an attempt to finish off the remainder of our wedding gift cards (it's been a year and we can't seem to finish it off). We set out our Christmas stuff already (I'll tell more in a future blog) and I was still missing some things though. I thought getting some pine cones would be a cute vase filler (I love nature things). So I went to grab a bag of pine cones-- 10 cones for $10. Sounded like a deal to me. But not to Chris. Chris: Are you kidding me? Becky: (with coy, sweet smile) What? 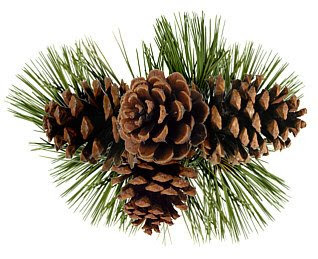 Chris: Are you seriously going to waste $10 on pine cones? Becky: (smile still there, and slight flutter of the eyelashes) But, honey we need more decorations. It's such a cute filler. Chris: You really want to spend $10 on something that you can get at the park? Becky: I had never thought of that before. What a novel idea! To actually go get real pine cones from the park for free! So we checked out with the rest of our stuff and asked for an extra bag. We took that bag to Memorial Park and went to town collecting pine cones!